In Morocco on 30 minutes from Dakhla you will find a little paradise (a beautifull blue lagoon) that and it is located the middle of the Western part of the Sahara. Morocco, officially the Kingdom of Morocco, is a country located in North Africa with a population of nearly 32 million and an area just under 447,000 square kilometres (173,000 sq mi). 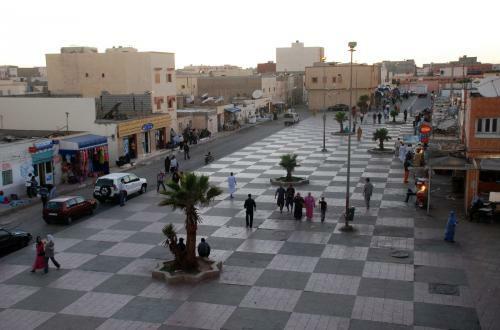 Its capital is Rabat , and its largest city is Casablanca. Morocco has a coast on the Atlantic Ocean that reaches past the Strait of Gibraltar into the Mediterranean Sea. It is bordered by Algeria to the east, Spain to the north, and Mauritania to the south via its Western Saharan territories. Dakhla offers you two opportunities. You can stay in a camp near the spot in a tent or in a hotel 30 minutes further. When you stay directly at the spot you can kite all time. Because of the atmosphere its a unique experience, but there is not so much to do besides kiting and when there is nog wind, the heat is hard to bear. The hotel is 30 minutes from the spot. The town where the hotel is located offers a littlebit more, the hotel in all inclusive and you can use the swimmingpoul and there is some enertainment. The food in both places are good (pasta, fish, rice, salad, meat, soup and deserts. But in the hotel the food is every day fresh and you dont have to pay for extra things like in the tent camp. The beste months to go to Daklha seems to be from april till september. 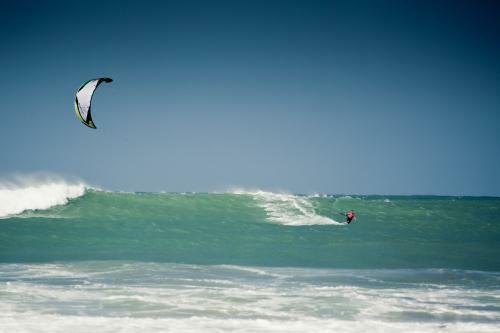 On a 10 minutes drive from Dakhla the ocean offers you a nice wave spot. The wind is off shore, so it is a nice opportunity to train your wave skills. 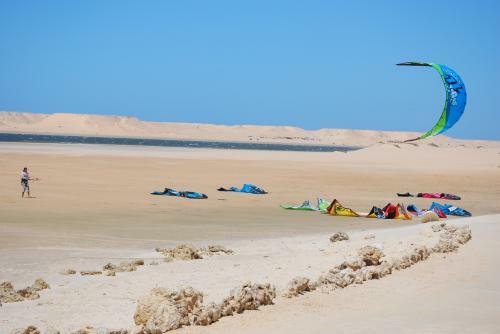 If you dont just want to do something more relaxing, you can go fishing, or visit Dakhla itself. It is a big sandy beach without obstacles. The water is flat and a littlebit choppy. You can stand everywhere. The wind blows from the north (north-east) and is side shore from the right. From the 30 days maybe one day is windless. In the morning the wind picks up with 4 BFT and at the end of the afternoon it can already be 7 BFT. The wind is thermical, so the wind gets stronger when the temperature rises. The local kitecentres have rescue boats. Toilets, showers and food are available. The lagoon (50km) is so big, you can do a downwinder if you want. You can also visit one of the wavespots nearby for a surf or kitesurf session. Dakhla liegt in Marokko. Der Kitespot befindet sich 30 Minuten von Dakhla entfernt. Es ist ein kleines Paradies (eine wundervolle blaue Lagune lagoon) mitten im westlichen Teil der Sahara. Dakhla bietet dir zwei Möglichkeiten. Übernachten im Zelt in einem Camp nahe des Spots oder in einem Hotel. Das Hotel befindet sich 30 Minuten vom Spot entfernt. Wenn du dich im Zelt schläfst kannst du jeden freie Minute surfen. Die Atmosphere ist einzigartig. Bis auf Kiten gibt es sonst nicht viel zu tun. Wenn der Wind mal auslässt kann die Hitze extrem werden. Das All inclusive Hotel sowie die Stadt liegen 30 Minuten vom Spot entfernt. Hier findest du mehr Angebot. Es gibt ausserdem einen Pool und etwas Entertainment. Die Küche ist an beiden Orten empfehlenswert (Pasta, Fisch, Reis, Salate, Fleisch, Suppen und Desserts stehen täglich zur Verfügung. Im Hotel ist das Essen täglich frisch und eben wirklich all inclusive. Die besten Monate für einen Besuch in Dakhla sind von April bis September. Das Wasser ist flach und etwas kabelig (choppy). Überall stehbereich. Der Wind kommt von Nord (Nord-Ost) und ist damit sideshore von rechts. Statistisch gesehen ist einer von 30 Tagen windrei. Morgens blässt der Wind zu Beginn mit 4 Bft. Gegen Ende des Nachmittags werden dann gute 7 Bft erreicht. Der Wind ist thermisch und wird daher stärker wenn die Temperaturen ansteigen. Die Kitestationen verfügen über Rescue Boote, Toiletten, Duschen und Küche. Die Lagune ist 50 km groß !! Gut geeignet für einen Downwinder. Ausserdem gibt es einige Wavespots. Der näheste befindet sich 10 Minuten entfernt von Dakhla. Der Wind ist offshore. Ideale Bedingungen um deine Skills in den Wellen zu verbessern.